Jules Chéret, a French painter and printmaker, was a distinguished figure in painting in late 19th century French art. He was the first artist to be well-known as a poster art painter. Chéret, who was born on May 31, 1836, started out as an apprentice lithographer and took art lessons in the evening. He was noted for developing a cheaper way to create lithographs in color, which in turn led to the development and use of lithography in posters for advertising. Chéret’s posters were distinguished for its creativity. The artist added graceful designs to the poster art, and started an independent form in decorative art. Fittingly, Chéret was considered as the “father of the Belle Epoque poster” and provided inspiration for other artists to explore the style. Later in his career, he produce a book, “Masters of the Poster” wherein the best poster designers were promoted. The artist usually included a female form in his poster designs, primarily to gather additional appeal from the viewers. His female subjects garnered popularity and Parisians called them Chérettes. Chéret was high successful in his chosen genre and creative over 1,000 posters. The first one he created was a Sarah Bernardt advertisement in 1867. He was accorded a major solo exhibition and presented with a gold medal in 1889 during the International Exhibition in Paris. In 1890, Chéret received the Legion d’Honneur and in 1928, the Chéret Museum was opened in Nice, France by the government to honor his graphic art achievements. Jules Chéret came from a poor family but they were creative artisans and he was exposed to lithography early. He had limited education and started to apprentice with a lithographer at the age of thirteen. He was an apprentice for three years and his interest in painting prompted him to enroll in an art course and studied the techniques employed by many artists through visits to various museums in Paris. He went to London in 1854 because the chromolithography and lithography techniques in the country were more advanced, although he did not gain that much of a success. He was employed at The Maple Furniture Company for a time as a sketcher. When he returned to Paris in 1858, he was given a commission to create an advertising poster for “Orpheus in the Underworld,” an operetta by Jacques Offenbach. He was again disappointed when his career did not take off and went back to London. He stayed there for seven years, perfecting his lithography techniques and learning the British style in poster printing and design. 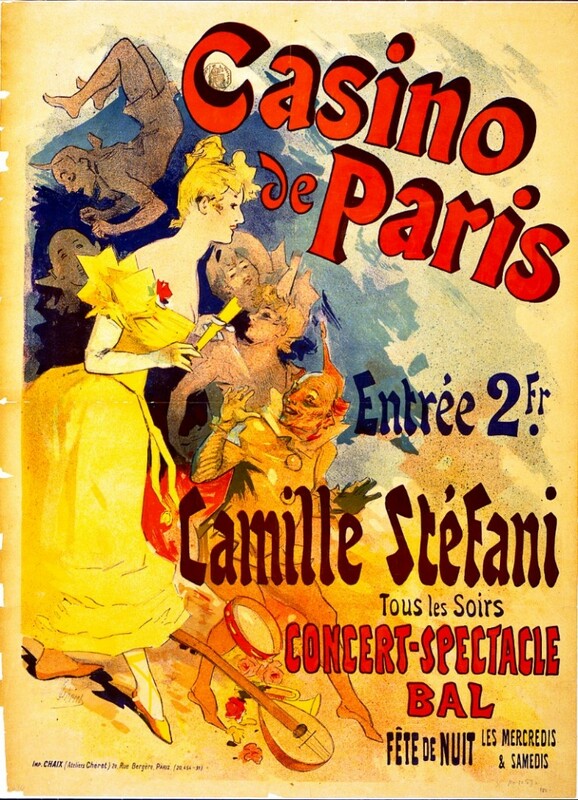 He received commissions to create posters for circuses, theaters, cabarets and music halls. Cramer, a publisher, had him produce illustrations and book covers. 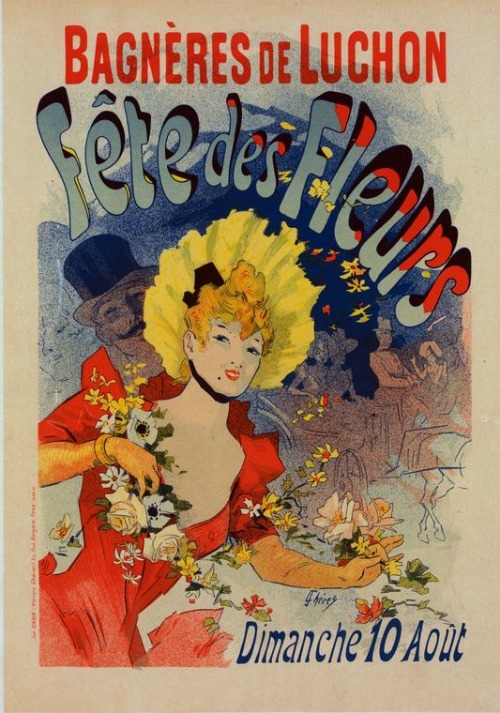 In 1886 he returned to France and started to produce brilliant poster ads for theaters, music halls and cabarets such as Moulin Rouge, Alcazar d’Été, Théâtre de l’Opéra, Folies Bergère, Olympia and Eldorado. Likewise, he produced illustrations and posters for Le Courrier française, a satirical weekly publication. Chéret’s works were influenced by Antoine Wattea and Jean-Honoré Fragonard from the Rococo period. He was in great demand and started creating ads for various clients, from touring troupes to various consumer products and municipal events. Later, he turned into a major advertising supplier and had manufacturing businesses and railroad companies as clients. His poster art was instrumental in liberating females, because it allowed them to smoke in public and wear low-cut dresses. He also influenced many painters and poster designers like Henri de Toulouse-Lautrec, Pierre Bonnard, Edouard Vuillard and Charles Gesmar. He also took in several students, including Georges de Feure, who became a popular painter, theatrical art designer as well as an industrial art designer.